ex-lib on inside back cover of the book. Illustrated Book. 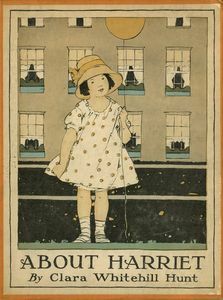 Hunt, Clara Whitehill, 1871-1958; Enright, Maginel Wright (Illustrator), About Harriet, Boston and New York: Houghton Mifflin and Company, 1916 (Copyright), Children's Literature Archive, accessed April 24, 2019, http://childrenslit.library.ryerson.ca/items/show/7987.